Y’all, I cooked a feast yesterday. A flippin’ feast. I made hamburger steaks with rice and onion gravy. I made biscuits. I made squash casserole. I baked sweet potatoes. And I made cucumber salad. But I couldn’t tell you anything about any of it. Because I also made these beans and they’re all I ate. I couldn’t. get. enough. of. them. Once I finished what was on my plate, I wrapped my plate up and stuck it in the fridge to be eaten some other time. Then I went and got a big bowl out the cabinet and filled that sucker slap up with more beans and potatoes. And then I went to town on them. When something tastes as good as these did, you don’t miss your window. Sometimes I like to use whole small red potatoes (we call them 'new' potatoes), sometimes I use yukon gold. You can use just about anything except baking potatoes (they won't hold up being boiled this long). This can also be made with canned green beans. It's not quite as good but I never met a pot of beans I didn't like so I think they're delicious too! Speaking of canned green beans... y'all ever heard the expression "cook the can out of the beans"? This is something we always did and I swear it makes a difference. We always dumped the beans in the pot (sometimes I drain the liquid then replace it with water) and cooked the t-total snot out of them. Something about this changes the flavor of the beans and gets rid of that "canned", artificial flavor. I do this before adding the beans to Green Bean Casserole too! Trust me, it makes a difference! BTdubs... when I'm heating up a can of beans to go with supper, this is what I do: Empty can into a small saucepan, add one bullion cube (chicken or beef... it doesn't matter) and 1-2 tablespoons of butter or bacon grease. Bring contents to a boil, cover, then reduce heat to medium and let the beans cook for 20-30 minutes (or until supper's done). That's close enough to perfect for a weeknight side dish for me! Wash and trim beans then cut into 2-inch pieces; set aside. Cut bacon into 1/2-inch pieces then sauté over medium heat in a large pot or Dutch oven until browned. Add onion and beans then continue to sauté for 2-3 minutes. Remove from heat. Cut potatoes into large cubes then add to pot. Add chicken broth (enough to cover potatoes), butter, salt and pepper to the pot then bring to a boil. Once boiling, cover then reduce heat to medium-low then cook for 30-45 minutes, stirring occasionally. Let rest 15 minutes before serving. You can make this with canned beans (probably 4-5 cans). Drain the beans and skip sautéing them. Just add the drained beans with the potatoes. Canned beans aren't as good but they're still pretty dang tasty. You can also make this in a crock pot. Once bacon, onion and beans are sauteed, add everything to a slow cooker then cook on low for 6-8 hours or high for 3-4 or until potatoes are tender. I use red potatoes or yukon gold. You won't want to use russet or baking potatoes as they won't hold up being boiled this long. Yum, they sound delicious. I could make a meal from this alone. At what point would you add the cream? I remember when I was a kid my mom made this but she cooked her green beans to a slow death--like for hours. I was well grown before I realized this was not necessary. That's what makes them so good. Especially if you are at the end of the bean season and the beans coming from the garden get a little tough. It works well. I've been making these for decades, following in the footsteps of my mom, her mom, and her mom, and on and on! You COULD make this with canned beans but don't do it. It's so easy to throw this together and cook in the crockpot and fresh beans make such a difference. This is one of my favorite dishes and I make it often. Also good with country ham instead of bacon. Hey do you have a recipe for a firm bread pudding. Yummm! Looks just like what my Granny used to make! Definitely good with ham instead of bacon, too! I made these today to see if I might want to serve them for Thanksgiving. I'm not a fan of southern style green beans (and I'm from Alabama), but these were very good. My only change will be to not cook them quite so long. My potatoes were softer than yours appear. These will appear at my family's Thanksgiving and also my in-laws this year. At 86 yrs. old... this is one of only THREE recipes that my Mother remembers how to make. She makes hers with much more broth and we eat it as a soup. Very, very good. I like the idea of this being served as a "side dish" ( or as a main course though) . Certainly YUMMY any way you choose to eat it If you prefer it as a soup simply add much more broth. Love beans & onions like this but our family has been using a small beef roast instead of ham/bacon. It's great-try it! Wow, amazing food. It looks so delicious. I want to try. This is EXACTLY how I make mine and they are always delicious! I grew up eating beans and taters like this but had no idea how to cook it. I made this Sunday and it was delicious! Maybe even better than Mommas! This recipe is a keep! Thank you for all your hard work. My favorite dinner as a child. My momma always served it with cornbread. My mom used to add white shoe peg corn to her green beans along with the potatoes and bacon etc. We would slice some tomatoes from her garden and it was all that we would want for dinner. This is the way that I make my green beans also. Oh, my, girl...I am drooling. Who needs anything else? My grandma used to make this dish and it was always my favorite! I'm sad I never got her recipe. I must try yours! Do you think it would work with frozen (thawed) green beans? Yes! When you have a garden you have lots! I make them all year! I made this recipe for Thanksgiving, it was awesome! I used new potatoes, fresh green beans and thick sliced pecan smoked bacon which made this even better. I'm eating some today for lunch with brioche rolls. Thanks for sharing this recipe! If cooking in a crock pot, will I need to cook the bacon first? Also, will the potatoes take as long as the green beans to cook? I always cook my bacon first. Not till it is crispy. just something I do. As for the potatoes depends on how big you cut them. I would fry the bacon first and drain it to crumble on top before serving. Just saute' the beans & onions in the bacon fat and add to the broth and potatoes. Who doesn't love crispy bacon? 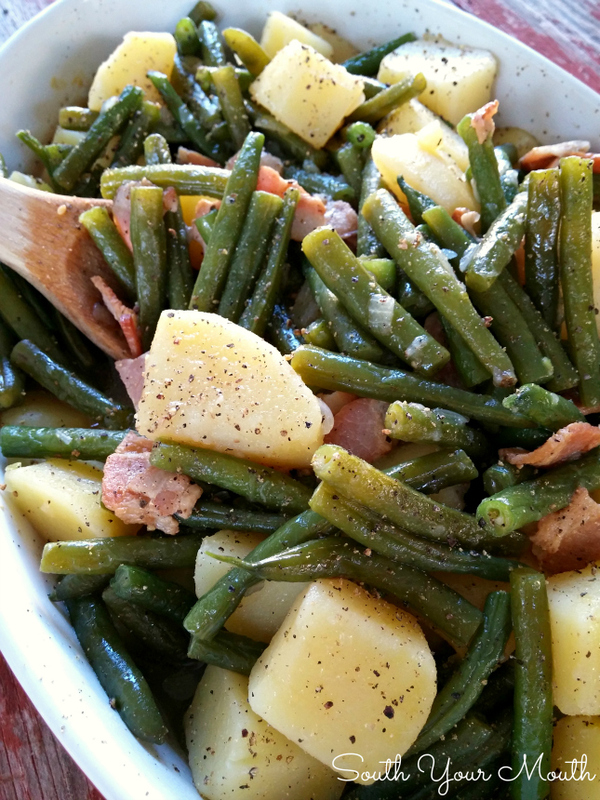 Ham and green beans was one of my grandmother's specialties, but I've never tried it, because I can't find the right type of ham around me. Maybe I'll give this a shot instead. How many "new potatoes" would I use? So I ran out of bacon, but I have turkey legs in the freezer. Can I use that instead of bacon? Smoked turkey legs...oh my. That would be so good! We add corn and at the end my mom made a light cream sauce. She at times would just use cream corn and forego the white sauce! Homemade bread and butter rounded it out! I love this dish!!! Girl!! I just made these beans and they were so good! I came across this recipe on Pintrest and had to make them. 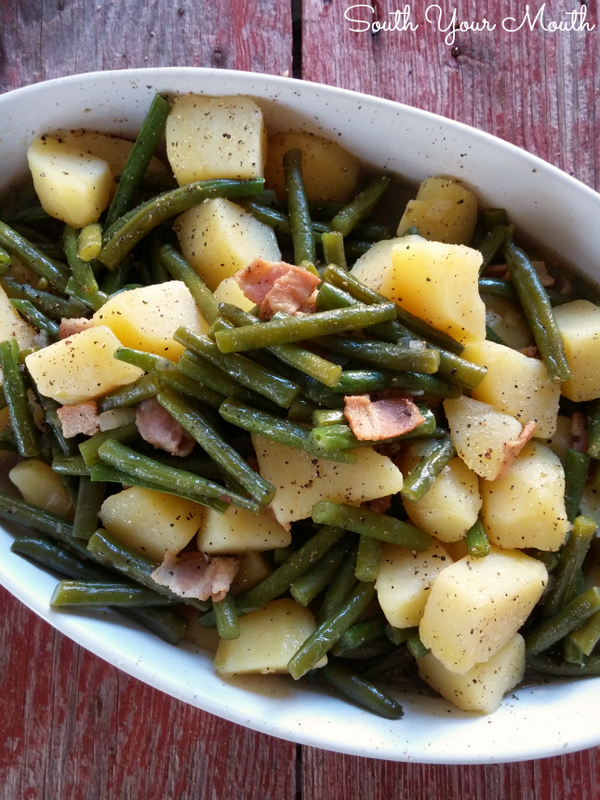 I had frozen french style green beans in the freezer already and the other ingredients on hand as well, except I had some left over country ham instead of the bacon. Threw it all in the crock pot and bam! After a few hours it was perfection. how much of the frozen green beans did you end up using? I just made this last night in the crock pot and it turned out SO good. I did it on 3 hours, might try 2 1/2 next time if I serve for guests, luckily, I like my potatoes very tender. The only thing I would do different next time is add the bacon to the dish after it's all done cooking in the crock pot. I pre cooked the bacon and put it in with everything but it lost all crispiness from cooking in the liquid - still wonderful tho! I’ve made these three times since finding this recipe on Pinterest! They are absolutely scrumptious! I love this recipe. I've made it dozens of times since I first found it here. It's one of those that will pair with almost any entree. Sometimes I use fresh green beans, sometimes frozen, and any kind of potatoes I have and it always comes out delicious. I like to make more than the two of us can eat so that I have leftovers to eat for breakfast or lunch. Thanks Mandy for wonderful dish. Making them for dinner today. 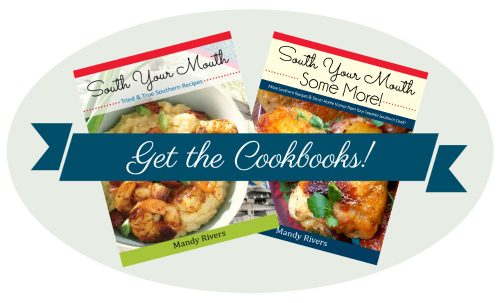 I totally had these in South Carolina and cannot wait to try them!! I love green beans - I can't wait to try this version!